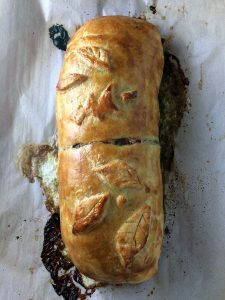 Forget about the traditional Thanksgiving dinner and get wild with serving this Elk Wellington for your friends and family! Add mushrooms, onion and garlic to a food processor and pulse until finely chopped. (You may need to do this in batches. If you do not have a food processor, finely chop mushrooms, shallots and garlic with a knife.) Over medium heat, add butter and olive oil in a 12” or larger cast iron skillet. Add chopped mushrooms along with leaves from the thyme and cook until all of the liquid is evaporated about 20 minutes. Remove mushrooms from skillet and set aside in a bowl. Season elk with garlic powder, kosher salt and black pepper on all sides. Cover loosely with plastic wrap and let the meat come to room temperature for 30 minutes before cooking. Heat cast iron skillet over medium-high heat adding 2 tablespoons of butter. When the skillet is hot, add elk and sear on all sides including the ends about 2 minutes per side. Remove from heat. Place 2 sheets of plastic wrap on a flat surface. (Note: the plastic wrap needs to be a few inches longer on each side then the length of the elk meat). Lay prosciutto slices on plastic wrap the full length of the seared meat. Add all of the mushroom mixture on top of the prosciutto spreading it out with a spoon or spatula. Season with a pinch of salt and pepper. Spread Dijon mustard over elk and then place at one end. Roll up covering entirely in mushrooms and prosciutto. Twist the ends of the plastic wrap and place in refrigerator for 15 minutes. Add flour to a flat work surface and lay out both pastry sheets. Slightly overlap one edge of a sheet on top of the other and roll into a rectangle wider than the meat. Remove elk from refrigerator and remove plastic wrap. 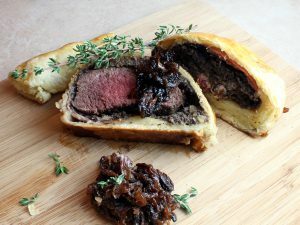 Place the meat in the center of the pastry.